A 62-year-old shop worker who was stabbed to death at a late night convenience store has been named by police. Locals paid tribute to Joan Hoggett, an employee at the One Stop Stop Shop in Sea Road, Fulwell, Sunderland, who died following an incident at around 10.41pm on Wednesday. A 19-year-old has been arrested on suspicion of murder. The worker, who was from Grindon and was well-known to local residents, was found with serious injuries and later died in hospital. Derek Campbell, 55, said: “I have lived in the street for eight years. Mr Campbell said there have been problems with local drug addicts shoplifting food, sweets and alcohol. Northumbria Police said the arrested suspect did not live “in the immediate vicinity”. Shakeel Rahman, 44, who works in a mobile phone shop nearby, said: “She was nice and polite. A One Stop spokesman added: “We are shocked and saddened by the incident, our thoughts and deepest sympathies go out to our colleague’s family and friends at this difficult time. “We are currently supporting all colleagues involved and assisting police with their enquiries. Superintendent Paul Milner said: “I would like to pass on my sincere condolences to Joan’s family at this incredibly difficult time. Forensic officers were seen going into the shuttered shop, which was at the centre of a wide police cordon which included side streets and back alleys. Two parks were also cordoned off while specialist search officers in blue boiler-suits and plastic gloves were seen arriving at the crime scene. Mr Milner thanked the public for their patience, as cordons were kept up. 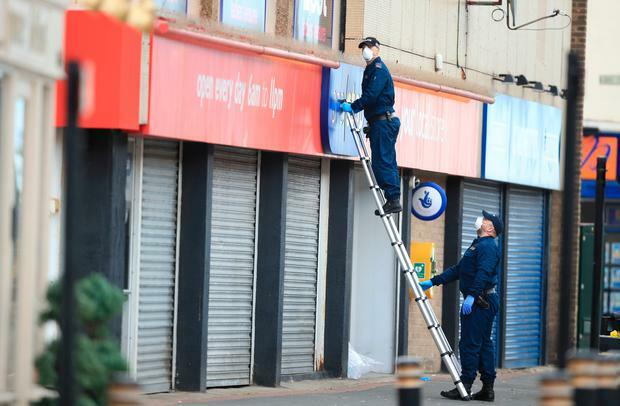 Officers were seen climbing ladders to search above shop fronts. Anyone with information was asked to call 101 or Crimestoppers on 0800 555 111.